KERALA, India, Jan 17 2019 - On 1 January, 5.5 million women formed a 620-kilometre wall across the length of the Indian state of Kerala (population 35 million). This was not like Donald Trump’s wall across the US-Mexico border, a wall of inhumanity and toxicity. The wall of these women was a wall for freedom, a wall against traditions whose purpose is to humiliate. 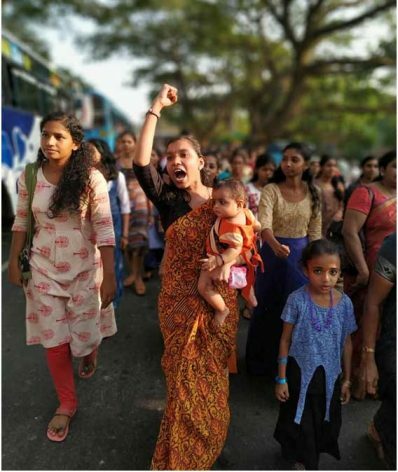 The immediate reason for the women’s wall was a fight over entry for women into the Sabrimala temple in southern Kerala. On 28 September 2018, the Supreme Court of India ruled that women must be allowed to enter the temple since the selective ban on women was not an ‘essential part’ of Hinduism but instead was a form of ‘religious patriarchy’. The Left Democratic Front government in Kerala embraced the judgment and fought off a challenge on the streets from the right-wing reactionary groups – including the ruling party in India, the Bharatiya Janata Party (BJP). In October, the Chief Minister of Kerala – Pinarayi Vijayan, a leader of the Communist Party of India (Marxist) – gave an important speech in defence of the breaking of customs. If a tradition is a shackle, it must be broken. Vijayan gave the call for this wall to be built by women on 1 January. People from across the state responded with enthusiasm. A hundred public meetings were held in the last months of 2018 to galvanise support; 175 progressive organisations joined the campaign. At 4pm, the women stood firm. They took an oath to fight for women’s emancipation and to conserve the values of Kerala’s renaissance traditions. K. K. Shailaja, Kerala’s health minister and a leader of the Communist Party of India (Marxist), stood at the head of the wall in Kasaragod in Kerala’s north. The wall ended in Thiruvananthapuram, Kerala’s capital, where the last person in the chain was the Communist Party of India (Marxist) Politburo leader Brinda Karat. The photograph above was taken by Sivaprasad Parinhattummuri. The central figure in the picture is Athira, a leader in Kerala’s left. She is currently the Malappuram District Committee member of the Democratic Youth Federation of India. She was a former Kerala State Committee member of the Student Federation of India. Athira had been imprisoned for her participation in a student struggle at Calicut University. She holds her six-month-old daughter Duliya Malhar. Emboldened by the Wall, two women – Bindu Ammini (a lawyer who teaches at Kannur University) and Kanakadurga (who works for the Kerala Civil Supplies Corporation) – walked into the Sabrimala temple. History is on their side.